Determining gifts for hunters can be a difficult problem for those that don’t partake in hunting themselves, and it is a terrible dilemma to want a great present for hunting friends or family and have no idea where to start. That’s why Mack’s Prairie Wings has put together a Holiday Gift Guide for those that want the perfect gift for the hunter in their life, and hunters can also help ensure they get the gift they really want by making their own wish list to go along with the guide. 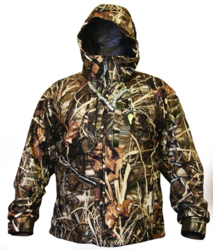 One of the top gifts for hunters is apparel. To stay hidden from your target as well as stay warm and dry, a hunter must have the appropriate gear. The Hunting Clothes at Mack’s Prairie Wings feature a wide variety of camouflage finishes, waterproof yet breathable fabrics, and are made to be comfortable and functional while performing at a high level. Watches are another classic gift option. Mack’s Sport watches are made with the hunter in mind and are built rugged to withstand the toughest weather conditions and an active lifestyle. Models such as the Luminox Navy Seal series maintain their luster and good looks and offer extreme durability, making them very suitable as a gift for a hunter. Hunters can customize their firearms with many different Gun Accessories. Shotgun choke tubes help optimize shot patterns and can also help reduce recoil, while universal wrench options make choke removal easy. Sportsmen can give their arms a break with a comfortable sling for carrying their firearm through all types of terrain. These accessories and more exist to make the hunting experience more efficient, and make great gifts for hunters. Whether the target is ducks, turkeys, geese, or deer the right Game Calls can significantly elevate a hunter’s odds of success. Mack’s intricate designs allow for exact replication of the user’s sound intentions. Hunters with the right knowhow will enjoy the precise sounds they can create or use them to teach newcomers to the sport. Vastly popular Duck Commander calls are effective and easy gift options. With the Holiday Gift Guide from Mack’s Prairie Wings, one needn’t be an expert to get the right gifts for hunters. The guide shares gift ideas for men, women, kids, and even hunting dogs. There are also options for those on a budget with a variety of items under $30. Hunters and non-hunters alike should use this holiday resource while it’s available so that everyone gets what they want for the holidays this year. Consumers should also check the holiday shipping schedule to be sure of receiving all gifts on time. To find more information on the Holiday Gift Guide, or to look at the large selection of gifts for hunters visit the Mack’s Prairie Wings website. Based in Stuttgart, Arkansas, Mack's Prairie Wings takes pride in being America’s premier waterfowl outfitter and offers the most extensive waterfowl hunting selection through their ever-expanding store, catalogs and website. The products offered by Mack’s are chosen by hunters, ensuring the best waterfowl and other hunting-related products at the most competitive prices including decoys, products for hunting dogs, optics, hunting and casual apparel, shooting gear, gifts and much more. Mack's Prairie Wings is part of the BizRate Circle of Excellence for customer service and satisfaction offering superior customer service, expert help and easy returns. For more information, please visit http://www.mackspw.com.